The Cutter Aviation Phoenix Deer Valley team is focused on maximizing your comfort and convenience. Our Deer Valley Airport location in North Phoenix is an excellent alternative to SDL/Scottsdale for operators of large aircraft such as a Gulfstream V and others with highly competitive fuel prices, ample ramp space, easy arrival & departures, and quick access to the Loop 101 / Pima Freeway and the I-17 Freeway for quick access to Scottsdale, Paradise Valley and Phoenix. 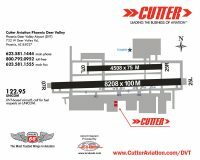 In addition, you’ll find a variety of line services and benefits at Cutter Aviation DVT. Cutter’s highly trained team of professionals is dedicated to making your trip to the Phoenix / Scottsdale area a pleasant one from start to finish. Our full-service FBO is staffed by NATA Safety 1st Trained professional line service & customer service staff. The following are our personal selections of several of our favorite spots nearby Cutter Aviation Deer Valley. We would be glad to make further recommendations based on your preferences.Allow us to make reservations for you and you’ll enjoy the Cutter Aviation discount at select properties. Call us at (623) 581-1444. I have been using KDVT and Cutter for many years in a TBM and Beech Duke. There is no better FBO service anywhere, in my opinion. The prices for a major airport are fair and competitive. But the service is always extraordinary, provided by a great team of friendly people! Kudos! Every time I fly to Cutter Aviation I am greeted with a smile. Whether it is from Molly, Amy, Paula, or Cassidy-Rae. We are always given the treatment as if we are the only aircraft on the ramp. My favorite part is being marshaled in by Karl. He is by far the most positive line guy I have ever encountered. These experiences are the reason we continue to fly into Deer Valley. Customer Service Manager Mike Quintero really knows how to assemble and lead a solid and professional team. Mike, as well as Corinne behind the counter, and Roger and Max on the line were excellent hosts offering plenty of help and every request. My business was in Scottsdale, but five minutes west on the 101 over to Cutter at DVT is worth it! My visit to Cutter DVT during Thanksgiving was exceptional. You folks took care of all my needs with no wasted effort or complications. I really appreciate a predictable and professional FBO with people who know how to take care of the customer's needs. I love this airport. Very friendly FBO, easy to access from the North. Thanks Tara and Mollie (?). Made the kids feel at home while I preflighted. Even some helpful hints on how to remove the cactus spines that my curious 8 year discovered. We'll be back. I stopped at Cutter on recent trip to Scottsdale area. DVT is farther by 9 miles to drive but has better fuel prices. My experience at Cutter was great. I emailed before I came and Mike and his team at Cutter arranged my rental car, met me at the plane with the car. Before we left I asked about parking near an electric outlet to plug in m oil pain heaters as it was going to be near freezing at departure time. They pulled it into their hangar and plugged it in at no extra charge. Above and beyond my expectations. 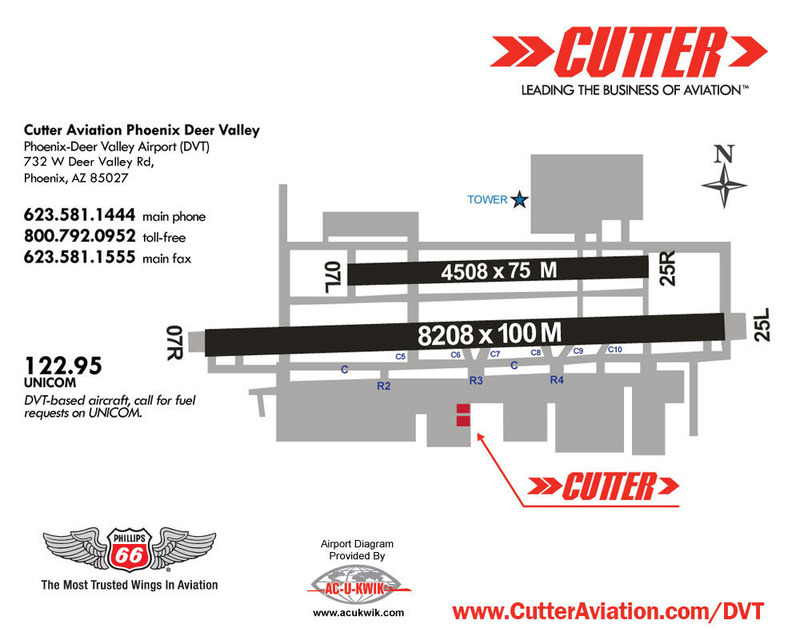 I definitely recommend Cutter aviation and DVT if you are heading to Phoenix. We got up early this morning to beat the convective development, and wanted a quick turn to make the most of the morning hours. Cutter delivered: the line guy was out with wands before we got there, and gave my mom a lift to the facility in the golf cart; the fuel lady topped us off promptly, and the rest of the staff were courteous and attentive. The airport itself is very busy with flight training activity; we burned a few minutes just waiting to cross the south runway. But the ATCT folks were patient and friendly, too. Cutter at DVT is doing a great job of serving the need of the customer. They have recently closed their maintenance shop and are definitely concentrating on FBO services. They were very accommodating with fuel services, refreshments, baggage handling, fees, etc. It is great to have this treatment in the Phoenix/Scottsdale area where other FBOs are quite expensive with no additional services. Always the best! Wonderful service, as usual, from this excellent FBO. Been here many times and never disappointed. Excellent overnight at Cutter last week! Great service, everything requested was arranged, helpful CSR and line staff. My goto FBO for Phoenix. My typical longer flights include an exhaustive search to fund an airport with an open restaurant for passengers, including a rest stop and fuel. I was not disappointed with DVT and Cutter. There were a lot of students in the pattern -- maybe the IFR flight plan made it easier to "cut in" and out with prompt landing clearance and maybe 5 minutes wait to take off (hint: land on the south runway for quick access to Cutter). I echo all the sentiments of earlier posters: quick rock star parking with experienced line guys and a spotless windshield. Plus the restaurant was better than average with quick service -- and about 100 steps from Cutter. Thanks Cutter and DVT! Just a great place to park in Phoenix. Delightful staff arranged ground transportation by phone. Had the car on the ramp waiting for me to shut down. Handled all my requests with ease and the whole staff is interested in airplanes. That's rare at larger FBO's. Flew into KDVT on Nov 21st 2015. Read on AirNav that Cutter is the place to go, so I did. I rented a Hertz car online (via AirNav) as well. On the morning of the flight I got a call from Hertz asking for arrival time and tail number. Once landed Tower pointed me to the Cutter ramp. The ramp guy showed me where to park, and not 30 seconds later my rental car was already parked in front of the airplane, amazing service! The guys tied down the plane (and later towed it into the hangar), helped with the suitcase, just a great experience all over. Ramp fees were waived with fuel which was a very good price, the people at the counter were super nice. Cutter deserves all the good things that are said about them here, thanks guys! My flying partner and I fly Angel Flight Missions. We spent the day at Cutter. We agreed that this is the nicest place we have ever visited. The people are what make it great. Thanks for great service. From Carl the lineman to Mollie at the desk, service here was exceptional. The rental car was waiting before we had the engine shut down. Carl helped unload luggage. Mollie arranged for hangar and plane wash while we were there. Typical excellent Cutter service. Bye bye SDL. Hello Cutter at DVT. I used to visit Cutter, as a corporate pilot, in a G-V, and before that a G-IV, Our treatment was always excellent. Our recent visit was no different in our Beech Debonair. Parking, rental car and service was just like we were in a jet. The people are terrific especially Tara, Janey, Max and the others there. Great job, Thanks to all of you. I fly in and out of Deer Valley weekly. Cutter is fantastic and makes the weekly experience enjoyable. Their staff is outstanding, customer service impeccable, professionalism is as good as it gets. I highly recommend them. Thank you Molly, Cassidy Rae, Carl and John and many others for taking great care of me. I recently stopped at KDVT for a fuel & food stop. I had a vacuum pump failure and ended up spending the night. The folks at Cutter were top notch. They found a new pump and drove 40 miles to pick it up. It was installed within one business day. The management and staff could not have been more helpful in everything from the aircraft repair to the rental car and hotel arrangements. We very much appreciated their service. We will certainly be back when we are passing through the Phoenix area. Flew into KDVT for a quick getaway with my wife this week. Tara had arranged for a car, which was brought out by one of the great lineman. They helped with luggage and securing the plane. On return, fueling was handled as requested and the staff handled loading and the rental car return perfectly. It is a very busy airport but well located and great staff. I haven't been treated better anywhere else. Great Job. Outstanding FBO...They understand customer service both inside as well as on the line. Great staff excellent service. Arranged a rental car and had it waiting on the ramp. We'll be back. We flew into Deer Valley for a local convention, and was told we should park at Cutter. I did, and wasn't disappointed. We had three rental cars waiting, all pulled up to the plane and we received help with the luggage. Everyone in the plane commented on such a friendly staff and good service. If we return to Deer Valley or any other airport with a Cutter FBO, they will be our first choice. Stopped with Cutter for 6 days in May. These guys are great! Helped with bags, had the plane fueled and ready. Gave me the best price on gas, previous week when I booked or while I was there whichever was cheaper. They also waved the ramp fees and overnight as I purchased Gas. So all I paid for the whole stay was the gas. I would definitely stop by again. Simon LaRocca and all the employees do a fantastic job every time we go here. They really know how to go the extra mile! Keep up the good work everyone. Went to DVT for breakfast. Cutter crew directed us into parking in front of their facility. Brought out the carpet, put chocks under the wheels and took care of us. When we departed our friends 180 wouldn't start. Cutter line service agent provided a jump-start and would not charge him. Great service delivered with a smile. I was just a "transit" CFII working for Accelerated Flight and Instrument Training (www.AFIT.com) with a local pilot for a 10 day IFR course. I flew in with my Maule from SGU since it was a 2 hour flight or a 6 hour drive. So "corporate client" I wasn't, but it did not matter. Bought some fuel and the ramp fee was waived - FOR 10 DAYS! Well, thanks - just a working guy who totally enjoyed the no hassle professionalism afforded me and my client. Today, I received a thank-you card. How nice. A BIG CHANGE from my local FBO at SGU who threw me out of his building because I wasn't a staff instructor. EXCUSE me, that's how it works out there - planes/pilots/students/instructors travel to different venues. So no improvement required! I'll be back to CUTTER next time my business brings me to DVT. Everyone at Cutter provided incredible service from the moment we landed. I would highly recommend Cutter and am looking forward returning soon. The staff at Cutter is one of the most courteous and professional I have ever experienced at any airport in the Country. They took a proactive approach to service. They even called and asked if they could put our plane in the hangar for us when storms were approaching. They used a team approach to service and we had as many as four well-trained lineman working with us...All smiling and asking what more they could do to help. I highly recommend going to Cutter when you stop at KDVT! I flew into Deer Valley (KDVT) AZ today. Two days ago I called Cutter Aviation and arranged a rental through Enterprise. I usually get an economy car at $42.00 a day. My wife and I usually travel alone so that is usually good but our son and dog were with us today. I inquired about a mid size the Cutter staff says its another three bucks $45.00 for a midsize. I'll take it. The Cutter girl never asks for a Credit Card. I arrive and as usual two Ramp attendants are there singling me into parking. There is a carpet already there when my wife exits the plane. As I exit the plane one of them says "How was your flight Captain." My wife and son already had a bottles of water offered them by the staff when he hands me a bottle. My wife is getting the dogs bowl out when one of them hand her another bottle for our dog. While I pulled in and shut down one of them had pulled the rental car around. They help me unload the plane and load the car. I pull around to the front and hand the staff my license and Credit Card and I'm out of there in minutes. I go here four or five times a year and this excellent service is the norm. I'll pay about 70 cents more for gas but getting 35 or so gallons is not a big deal especially since they waive one night ramp fee. No doubt I'll leave with three more bottles of water. I once called with my normal car rental request and arrived as usual. When I arrive there was no car and they didn't know I was coming. When I checked my call log I had mistakenly called Cutter at Phoenix. Not a problem they had a rental on hand and I'm out of them in minutes. tank and cleaning the windshield. I know that is a thing of the past but those of you old enough to remember the men in whites with a cap (not a baseball cap) but eight pointer it is a different time. It seems that not to many people are willing to pay for quality in product or service which is to bad in my book. Times are tough and I try and get the best fuel prices I can but quality service is sure nice. Arrived late at night. Car ready. All went smoothly. Departed the next day after excellent service. First time in all my traveling years, I left my luggage in the trunk of the rental car. Received a call from Tara at Cutter checking that the luggage was mine and she Fed-Ex'ed it the very next day! I'm sure she did it on her own time too. Great service!! My choice in the Phoenix area. Great overall experience. Called in advance and asked Miguel about hotel rooms. He got us a great rate at a nearby hotel that exceeded our expectations. The line crew greeted us upon arrival and helped us unload and tiedown. Could not have been more helpful. After a three-day stay we were fueled up and ready to go with the prompt help of the line crew and terrific office staff. Well done... We will be back. I have never had a bad experience here, but I would like to thank three guys who always seem to be the first to help me out. Jeff, Kyle and Max. These guys are quick with my bags, fuel if needed and get me on my way. Thanks for your hard work. I cannot say enough good things about the Cutter crew. We were dispatched to KDVT in support of the Wildland Fires north of Phoenix. Our crew consisted of a pilot with the helicopter and 2 ground support personnel with a truck and fuel trailer. Showing up last minute without prior notice, Max and the crew out on the ramp eagerly assisted me with parking the helicopter out of the way and assisting with the helicopter gear. I explained our crew situation with having a fuel trailer with us and needing a secure place to leave it. The Cutter crew allowed us to leave it with their fuel trucks taking a lot of our pains away. Once we made out way inside, Tara and the team inside were more than willing to assist with great hotel rates and dining recommendations. Hands down the KDVT Cutter crew is the best FBO we have worked with. I could continue on for days on how professional and amazing they are. Not only do they provide a great welcoming committee, but well staffed with great people. Stopped at KDVT due to weather. Because I was tired I stopped at Cutter instead of the self service fuel on the north side of the field, knowing that on departure I could still taxi over for the cheaper fuel. Because the staff was so helpful and actually saved me about twice the difference in total fuel price with their special hotel rates, I was happy to buy fuel from them (their fuel prices are reasonable anyway). If I am in the area there is no question which airport and which FBO I will stop at. These people are first rate. One of the best FBO's ever. Line folk were on the ramp with cold water and a cart to take us to the building. Tara in the front office is amazing, friendly and very efficient. Would not think of ever going anywhere else in the Phoenix area for service. Cutter Aviation continually provides superior quality and consistent great service! Besides the great deals on JET-A, the helpful staff and Beautiful CSR'S make the decision to stop at cutter, while visiting the Phoenix area a no brainer! Mollie and Cassidy-Rae are great to work with. The Air Charter Advisors arrange flights on a weekly basis to and from Deer Valley and use Cutter for the FBO needs. We appreciate their top notch customer service and will continue to use you! Add one more to the many great reviews on Cutter Deer Valley. I flew in there yesterday (8/15). There is a heat wave in Phoenix right now so it was about 100 when I landed at 10AM. The follow me car was ready as was my rental, which was brought up right by the plane with the a/c running. The ground crew got us squared away and helped us put the cover on the plane. Of course they also had cold water. Elapsed time from shut down to driving off the tarmac was about 9 minutes. I had originally tried to book my car through Hertz. Don't even bother, they tried to charge me through Monday even through I was only trying to stay through Sunday. I eventually did what I should have done and just called Cutter directly. Took about 1 minute to make the car reservation over the phone. They fill out most of the paperwork for you on the rental, so minimal hassle/delay. Departure experience today was exactly the same. DVT and Cutter are my new go to operations in Phoenix! You really feel welcome at Cutter. Including me, there were two single engine prop plans arriving at 11AM Friday 10/10, and one single engine turboprop departing. Aside from that, I found out Cutter was one man short out on the line. But did we all get first class handling and service? Yes! Thanks to Carl, Kirsten, Mollie, and Alfred who ran back to the cart to get me a cold bottle of water for departure. Supervisor Tara took care of everything, despite being busy adding a fresh coat of paint to the lobby in time for the upcoming Super Bowl. Cutter is still the best. Our overnight stop at Cutter at KDVT on 11-18-2013 in our C-210 was delightful. Extremely helpful personnel everywhere! The ladies in the office (Brittany and Tara) were great. They arranged our rental car, which was brought to our A/C as we parked. Fuel was much less costly than KSDL and we received a 10-cent discount for using a Phillips credit card. Line crew (Wayne) was very helpful too. Helped us load our luggage (and wine from Costco) and returned our rental car for us. Great service all around. We'll be back! I don't usually take the time to write reviews for FBO's but Cutter at DVT has been great. My company issues fleet credit cards without employee names on them and when a hotel would not take it once, Mollie at Cutter went well above and beyond, taking time to call several hotels in the area trying to get me situated for the night. My next time in, I called ahead to Mollie and told her I was going to be parked on the city ramp. They were very helpful in fueling me on a ramp that was not theirs as well as getting a rental car lined up for me on short notice. She even took a photo for me and my proud parents out by the airplane after giving us a ride out to the plane (which was not parked on their ramp). Most FBO's are good; Cutter (Go Mollie!) is exceptional. Wow! Every employee we dealt with in the office and on the ramp were absolutely outstanding!! Big smiles, can do attitude, gracious manner, and went out of their way to cater to our every need. In 7, 000 hours of flying over 40 years, this is the best FBO service we've ever received. GREAT JOB TEAM! It was awesome to observe and experience a truly professional organization during these years Super Bowl in Phoenix. The Deer Valley Cutter team handled the increased traffic and nuances of a slot time event like it is something they do every week. As a regular customer to Cutter DVT, however, I was not surprised. 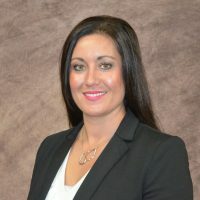 Tara and her staff are truly the best of any FBO that we experience from fuel (Jet A) prices to line assistance to truly exceptional customer service and hospitality. It is a great culture at Cutter. As always excellent service at Cutter DVT. In roughly 50 visits to Cutter PHX and DVT I've yet to have a bad experience. Top notch and reasonable fees. Thanks! Tara, for one, understands customer satisfaction. Thanks Tara! I recently returned to Cutter at KDVT, for short-term hangar. Having last hangared with them in January of 2016. What was comforting was that Simon LaRocca is still there, as are several of his young team members that I recall from the previous stay. Simon promptly and efficiently confirmed my hangar arrangements via email weeks ahead of the stay, and it was a genuine pleasure - almost of homecoming of sorts - upon my return. Cutter's KDVT outfit is first-class; they very obviously take great care in how they move the aircraft around, the staff is genuinely friendly and accommodating, and the fuel service is prompt and professional. I will report again towards the end of my stay but Simon and his crew earn top marks from me for now. Highly recommended.